The earliest known religious service in the Village of Dixboro took place in 1828. 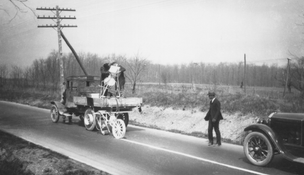 It and subsequent services throughout the next three decades were led by Methodist circuit riders. Traveling a 40-mile route stretching from Nankin (Canton) to Ann Arbor, these preachers on horseback would arrive every three to four weeks, lead worship in a private home or one-room schoolhouse, then move on to the next point on the circuit. Inspired by a revivalist’s preaching in 1857, a group of citizens met and authorized the building of a church. The cost was not to exceed $2,500. A Board of Trustees was appointed, and the present sanctuary was completed in 1858, on time and $259 under budget. Listed in the National Registry of Historical Buildings and Places, this picturesque New England-style structure, peacefully situated adjacent to the Village Green, has been admired by many passers-by. Attended and supported by hard-working farm families, many of whom have descendants among the present membership, Dixboro Methodist Episcopal Church grew and thrived—and struggled through periodic hard times. A basement was dug in the early 1920s allowing a furnace to be installed. A two-story "church house" was added in 1950, constructed by volunteers. 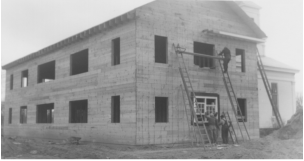 With a local philanthropist providing matching funds ($1.00 per hour worked), the 6,000 hours of donated labor allowed the building to be dedicated debt-free in 1951. The wing containing the present Fellowship Hall and Parlor was added in 1969 at a cost of $131,000. In 2006–2007, the sanctuary was renovated while retaining its historic look and feel, and the steeple was restored to its original height. The rural character of Dixboro began changing with the advent of the building boom of the 1950s. New subdivisions and residential developments have brought fresh perspectives into the community and growth to the congregation. The present Dixboro United Methodist Church is a diverse mix of young and old, traditional and contemporary. A strong commitment to mission and community outreach is a hallmark of this congregation. The motto "People Helping People" was adopted in the mid-1970s. The Dixboro Fair, held the first Saturday of every August on the Village Green, annually attracts hundreds of visitors and has raised thousands of dollars for local charities. Vacation Bible School, participation in the community food bank and shelter meal program, and the annual youth mission trips are among a variety of projects for helping people close-to-home and overseas. 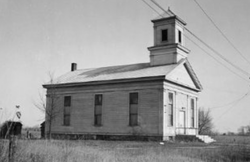 A long list of pastors has served the Dixboro Church. Also, a significant number of young people from the congregation have answered God’s call to the ordained ministry. Membership growth has made it possible—and advisable—to add paid staff positions: Minister of Missions and Nurture, Minister of Youth and Children, Director of Music Ministries, Keyboardist, Administrative Assistant, Nursery Care, and Custodian. Despite over a century and a half of growth and change, Dixboro United Methodist Church remains firmly committed to Jesus Christ and a warm, friendly congregation, where members feel like family, and visitors are always made to feel welcome. This vital part of the body of Christ will continue to meet the spiritual needs of an ever-expanding community.